A burned vehicle sits between the buildings at 77 Noble Street. Fire officials said they were initially called to the scene to investigate the vehicle fire and then battled the fire on the two nearby roofs. They could not say definitively Tuesday morning if the vehicle fire caused the fire on the two buildings. 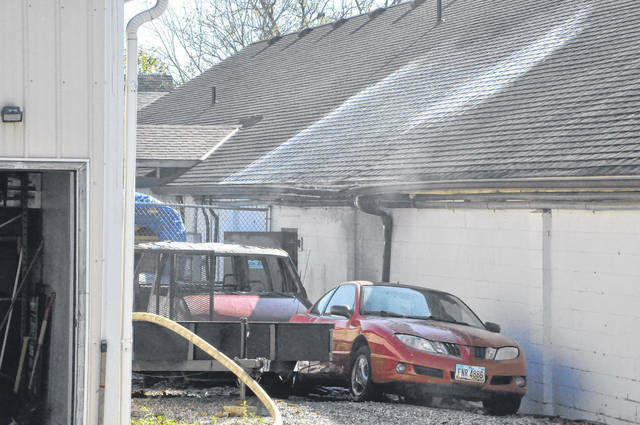 No one was injured in a fire that damaged a vehicle and two buildings Tuesday morning on Noble Street. City of Delaware Fire Chief John Donahue said Tuesday that the fire department was dispatched to a vehicle fire located at 77 Noble Street at approximately 10:15 a.m.
Donahue said when firefighters arrived, they saw the fire had spread to two nearby buildings and said firefighters had to enter those buildings to extinguish the blaze. Donahue said at that point the call was upgraded to a working fire and said firefighters had to enter the attic to contain the fire. He added that firefighters knocked the fire down relatively quickly and said it was pretty much extinguished by 10:45 a.m.
No one was injured, Donahue said. The cause of the fire is still under investigation, he said, adding that they were unable to 100 percent say if the vehicle fire spread to the two buildings or if something else happened. Donahue said the buildings were a challenge to access because they were segmented, like a strip mall, and said firefighters had a difficult time creating access to the fire. Donahue reported that fire units from the Tri-Township Fire Department, the Liberty Township Fire Department, the Concord Township Fire Department, and the Elm Valley Fire Department all responded and assisted in fighting the fire. This entry was tagged city of delaware fire department. Bookmark the permalink.